Rats! I missed the firing of the cannon. Three times! Every time the reenactors prepared to fire the cannon last weekend at the annual Lester River Rendezvous, I was engrossed in some other amazing learning experience and didn't get to watch. I sure heard it though! I had been anticipating the rendezvous most of the summer, not unlike the northerners of a bygone era. For nearly a century, primarily in the 1700s and early 1800s, trappers, traders, Native Americans, Métis, Frenchmen and Scots, British and American -- among them the flamboyant voyageurs -- arrived from points scattered throughout the wilderness for the yearly festivities called the rendezvous. Rendezvous took place at important forts all throughout the Great Lakes region. At these locations, men who'd lived a rugged existence in the wilderness harvesting furs, company clerks, or bourgeois company men arriving from the east, came together to engage in the exchange of pelts for goods. In the process a fortune was made for the North West, XY, and Hudson's Bay companies. But the rendezvous was also a time when all these wilderness folk enjoyed revelry, feasting, gaming, and occasionally brawling. The event would last for several weeks in summer, then just as quickly when it ended, everyone would disperse. The hunters and trappers returned to the forest and native villages, the clerks to their posts, the voyageurs to winter in the Upper Country or back to Montreal with canoes mounded with bales of pelts, eager to satisfy the European hunger for fur. This last week I attended a re-enactment of one of those events just north of Duluth, Minnesota on the Lester River where it twists and tumbles over rocks and down the hill. There it spills into magnificent Lake Superior. I couldn't absorb the experience any more eagerly! Here are some highlights. This fellow went by the rendezvous name of Jacques LeChristian. I asked him right off if he was a bourgeois trader, and his eyes brightened. "Why, yes I am!" he said. Later in the day I purchased a CD of voyageur legends told by my new friend Monsieur LeChristian. 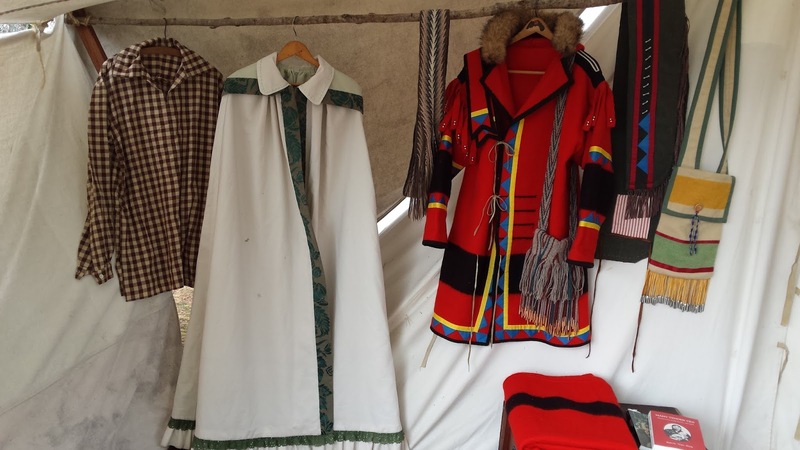 The Lester River Rendezvous is set up mostly as an educational village open for two days to school groups, and then one day for the general public. 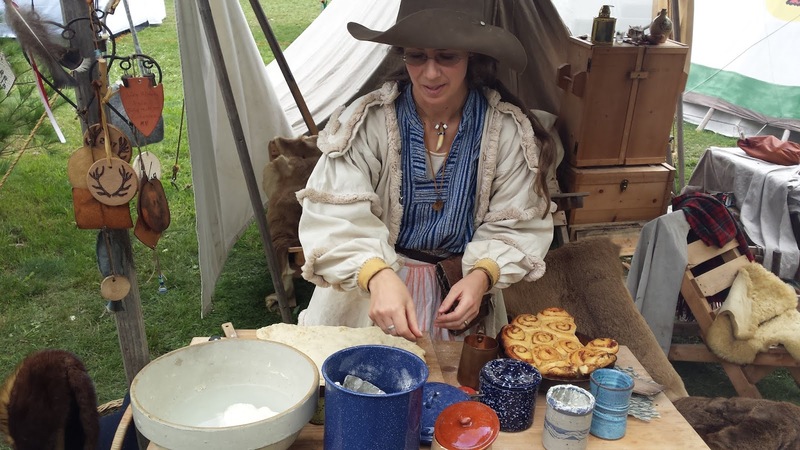 Thousands of visitors enjoy free entrance onto the site where they can partake in food and music, and most excitingly, a visit to the Voyageurs' Village. Here I am on the river, experiencing the excitement of the rendezvous which has so much to do with the time and setting my new novel Mist O'er the Voyageur coming out next Wednesday. 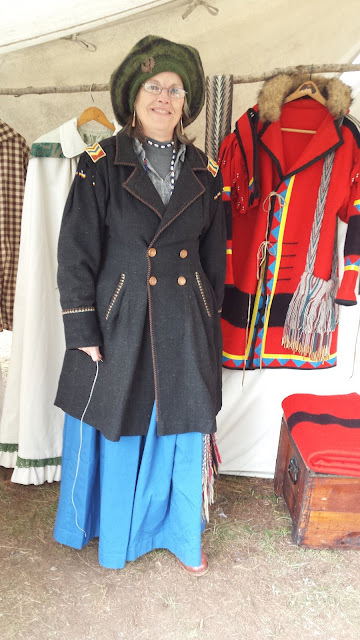 I enjoyed a number of demonstrations of how people used to live during those times while I strolled through Voyageur Village at the rendezvous. 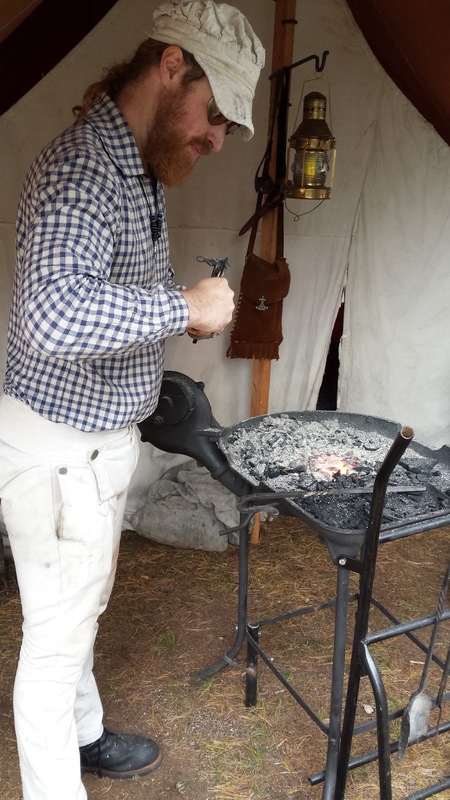 In future posts, I'll give some of the "how to" details I learned for everything from rendering bear fat to starting a fire with char cloth and flint. The lady above was of Métis heritage. 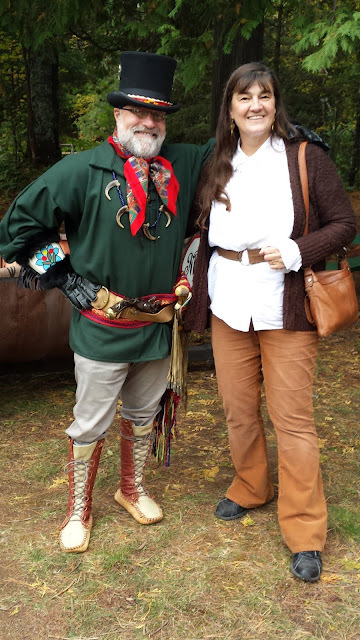 I enjoyed hearing her talk about her ancestors and the vital role of the Métis in the fur trade and voyageur era. She also sewed all these beautiful costumes! This lady was busy tanning hides. She described various processes to do it, depending on the type of finished product. 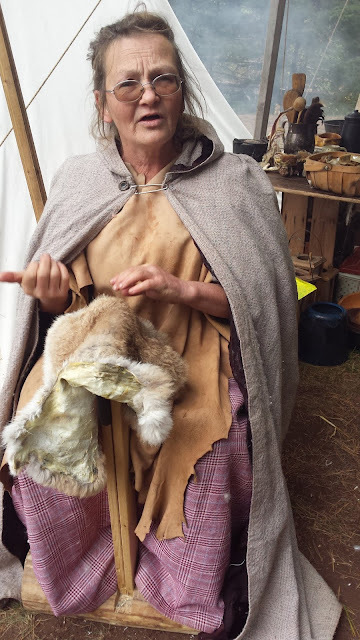 Here, she is softening a rabbit hide. She also had a large number of other interesting items on display including this box of glass beads. 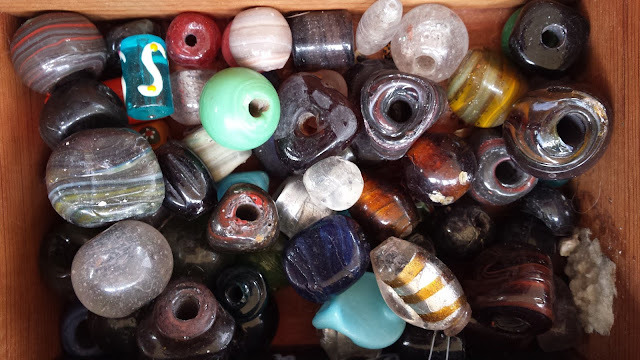 Beads were a popular trade item during for many years. The lady in the photograph above is making sour dough cinnamon rolls. Not so unusual in itself. However; she's also teaching about the process of making and keeping sour dough, and she's baking them over the fire in a "Dutch oven". More on that in a future post! 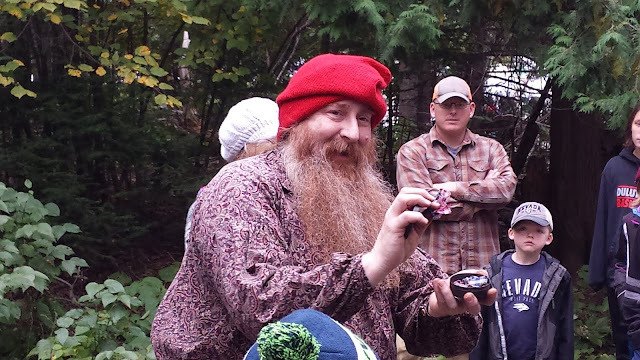 This red-hatted fellow was so engaging! He had the children and adults enraptured as he demonstrated the method used to build fires back in a time when matchsticks hadn't been invented. He had to take special precautions with that beard! 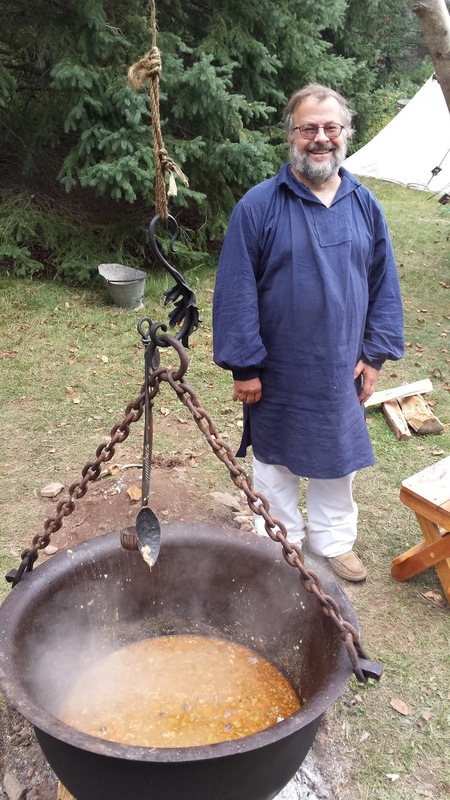 Above we have the tinsmith selling his wares, and below is the blacksmith. I wish I could have invested in the beautiful ax or some of the gorgeous knives he created. I settled for a lovely little robe hook for $2. Now that's an affordable souvenir! 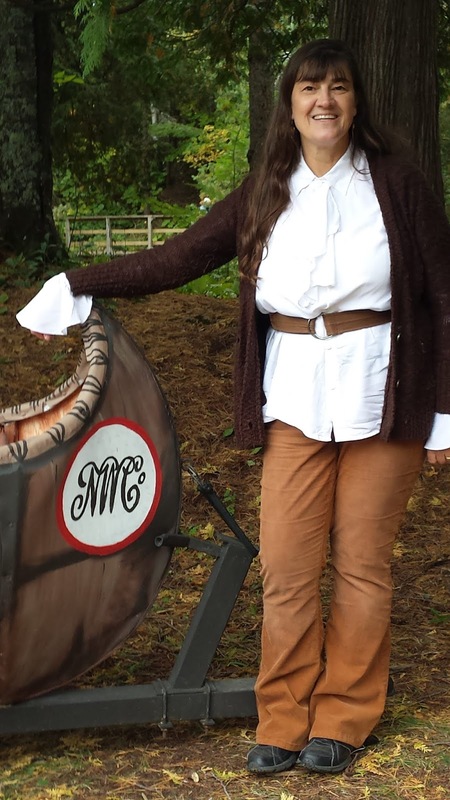 Though this was not a real birch bark canoe (this one was "disguised" as a real canoe so that the kids could get inside and learn to paddle) I had to get a picture standing next to the North West Company emblem. 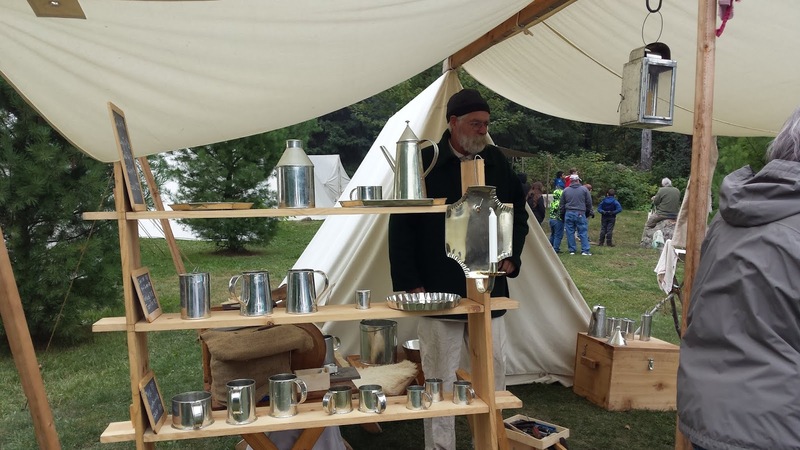 Have you attended any rendezvous re-enactments? Next on my schedule are the Forts Folle Avione Rendezvous on the Yellow River in Northwest Wisconsin, and the Great Grand Portage Rendezvous in Grand Portage, Northeastern Minnesota. Living History provides a learning environment of discovery and engagement in a way that reading a history book can't provide. Whatever part of history you're curious about, from the French and Indian wars, to the Civil War, to visiting an historical speakeasy -- it's a vivid way to dig deeper into history that you don't want to miss! Now it's time for a drawing! I had a HUGE stack of her books. She was a real trail-blazer! I grew up in a Christian home and I think the first Christian fiction read was a GL Hill book I found at my grandmothers home. Thx for the opportunity to win the book. I’m looking forward to reading it. The first I recall was Christy that my aunt lent me back in 1969. I read it back in the early 90s. Really good book. I do not recall but I know I do love reading them. Wow! That's some voracious reading. I remember the days when I could read fast... Can't seem to do that anymore. I read a lot as a child. As I got older, so many books were not Christian oriented in any way, so reading didn't take a priority in my life. On a trip to Poland, all alone, I chose 2 Christian books and have never turned back. Thanks for this giveaway! You're welcome! And now there are SO MANY great reads out there. My TBR pile is huge! My Grandma Cook introduced me to my first Christian Fiction. She loved reading Grace Livingston Hill books so she loaned a few of her favorites to read. I especially liked our book discussions after I read one of her books. Thank you for sharing abour your trip. Wow, very interesting! Thank you for sharing the photos, too. So glad you enjoyed it. 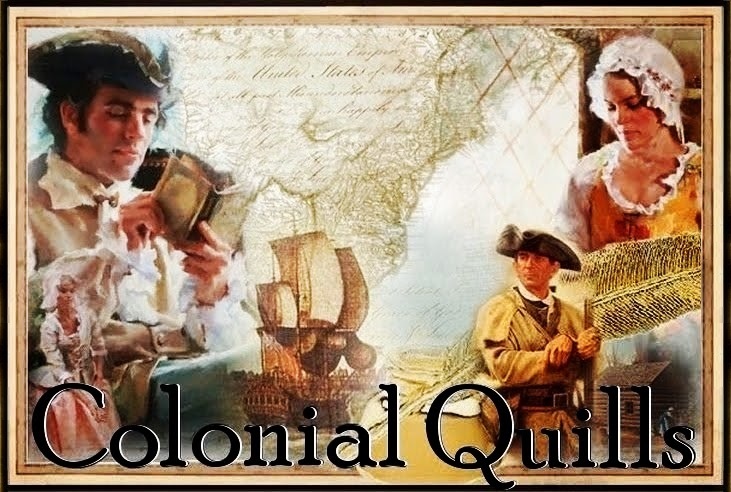 I'm excited to break down some of the those olden times activities in future posts. Wow! Thanks for sharing and for posting all those photos. Fascinating stuff. Don't you just love it? If I could, there's a few other ones I'd like to attend. Maybe eventually. My 5th ^ th grade Sunday School teacher gave us Danny Orlis books each Christmas! What a sweet gift! We had one here when my boys were younger. Kind of like the Sugar Creek Gang. Growing up my mother kept me supplied with Christian Fiction (Chronicles of Narnia and Lord of the Rings were two of my favorites). The older I get the more I appreciate squeaky clean story-lines and God honoring characters. Just goes to show what an influence we can have on kids! I think about that a lot now as a grandma (13 blessings!). Very interesting post! My parents had a few Christian fiction books, when I was growing up and I also had some Christian fiction children's books. I became an avid Christian fiction fan when I read Terri Blackstock's 911 Newpointe series. 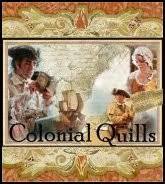 I love mystery/suspense and historical fiction. This books sounds great!